Ela Orleans should be a familiar name to regular readers. Ever since Glasgow's finest record store Monorail turned us on to her astonishingly good Tumult In Clouds album - which went on to be awarded the inauguaral Dead Albatross Music prize in 2014 - we've been smitten by her music which veers from avant-ghost pop to cinematic experimentalism. The Polish born artist has been living in Glasgow for a number of years allowing us to catch numerous live performances, both as a solo artist backed by moody video projections, and in art commissions where she has soundtracked silent films as varied as Carl Theodor Dreyer's supernatural horror film Vampyr and Frank Borzage's romantic drama Lucky Star. Both formats have proven her obvious versatility as an artist and composer and each has been enchanting and captivating in its own way. Circles Of Upper and Lower Hell is her seventh album and it marks a return to the expanded palette of songs and sound textures that made Tumult In Clouds such an inventive and ambitious recording. It also offers a more expressive and expanded take on her previous Howie B produced album Upper Hell, an album which smoothed her edges and heightened the rhythms. And while we loved that album's streamlined, smoothed grooves, Circles Of Upper and Lower Hell, spread over four sides of vinyl, delves further into her personal interiors and expands on the sonic terrain providing a more thorough working of the turmoil and despair that infused these recordings, taking literary inspiration from Dante's Inferno as well as poetic insights from Sara Teasdale, Arthur Rimbaud and Aleister Crowley, as it journeys through atmospheric pop-noir, experimental interludes and cinematic symphonics to great effect. From the sparse drenched atmosphere of 'Gate', you just know Circles Of Upper and Lower Hell is going to be something special. 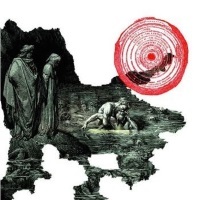 The theme of the album is instantly revealed through the words of Dante in the opening lines of 'You Go Through Me': "Through me you go to the grief wrecked city, Through me you go to everlasting pain". A serene and solemn agglomeration of voices combining the harmonies of Stephen and Katrina of seminal indie stalwarts The Pastels with Ela's plaintive tones are sprinkled with organ chime and slow enchanting electronics to create an achingly beautiful slice of noir-pop. It's the first of many gorgeous moments on an album that features 25 tracks with a running time of 74 minutes. 'Circle One' may be familiar to listeners as it features a reassembled take of 'Dark Floor', one of the pop highlights from Upper Hell. In this configuration it is darker still. And jazzier too. The multi-layered chorus of "No tears, no pain, no talk, no light" is set against warming synths, glockenspiel and loping basslines. It's a fine example of Ela's captivating songwriting but I'm really taken by the drums, where electronic rhythms run alongside some stunning jazz drums. I can't help thinking of Charles Hayward's contribution to the Coil track 'Love's Secret Domain' here as well as on the later 'Abyss'. On 'Abyss' jazz drum rolls merge with electronic beats, amidst percolating electronica and an assortment of harmonies and whispered tones in this return visit to the 'City of Dis'. Tumult In Clouds dabbled with dance beats amidst collaged Motown and psychedelic grooves and it's perhaps fair to say that Upper Hell at the hands of trip-hop producer Howie B put too much emphasis on the dance rhythms. Circles Of Upper and Lower Hell isn't without its fair share of "haunted dancehall" beats though. The stuttered synths of 'Phlegethon Woods' forgoe the obvious industrial techno aspects of its Upper Hell predecessor, 'Upon The Abysses'. This time around 'Hands In Dark' along with 'The Heretics' are more in keeping with the dark minimalist ouevre of the album. 'The Heretics' offers dark grooving electro beats overlayed with droning synth melodies, piano chords and prog electronics; the pensive stabs, majestic keys and layers of wordless ghostly harmonies of 'Hands In Dark' create a crepuscular soundtrack set to rolling rhythms. Her ability to create darkly cinematic sounds is furthered on 'Tower' a disturbingly effective outing of low key beats where discordant shifts are shadowed by solemn strings. Other tracks shroud Ela's voice in heavily manipulated treatments. The abstract patterns of 'Sensation' mix echoing shudders and sax parps with ghost harmonies before settling into an evocative setting of bucolic pipe drone and liminal synths where in treated tones she recites the Arthur Rimbaud poem of the same name. 'Sunlit Hill' furthers the use of vocal treatment; its spoken voiceover given a dreamy childlike innocence reciting excerpts from Dante over dank and despondent synth score. Ela's use of the organ is particularly distinctive; giving the music a bewitching ghostly glow. The haunting timeless veneer of tracks such as 'Light At Dawn' and 'Risky Trip To The Underworld' from Tumult In Clouds elicited favourable comparisons with offerings from the Ghost Box label, and having Circles Of Upper and Lower Hell mastered by Jon Brooks (of Ghost Box recording group The Advisory Circle) is a genius move as he brings an understanding and clarity to Ela's vintage synths and ghost littered songs. And while passages of 'Circle One' use organ, it really comes to the fore on some of the other tracks. Amidst the whispered tones and rhythmic beats of 'Charon', a light organ carousel chime is cut with sweeping symphonic flourishes. It's even better on 'The Great Barrier' which really exemplifies the haunted air that permeates her music. Moving from an assemblage of ritual chants and whispers, accompanied by piano notes, the haunted carousel swirl is reminiscent of old black and white horror films and particularly Gene Moore's atmospheric organ soundtrack to Herk Harvey's cult movie Carnival of Souls. It's something I would love to hear Ela Orleans, who has been soundtracking a number of silent films recently, play live to. 'Ring Two' unfurls like a condensed horror soundtrack combining symphonic strings with disembodied keys, ominous trumpet fanfares and haunting harmonies, whereas the gentle strings and woodwinds of the following 'Geryon' evoking images of wide open landscapes are more reminiscent of the pastoral moments of Paul Ferris' soundtrack to Witchfinder General. 'Geryon' is just one of a number of short instrumental interludes interspersed throughout Circles Of Upper and Lower Hell allowing Ela Orleans to showcase her more experimental and modern classical sensibilities. They range from the more abstract compositions of the disembodied piano keys of 'Calaphas', the off-key tones, chime and drone of 'Styx' to the ratchety tones of 'Centaurs' to the light evocative synths of 'Thorn Tree' and the brooding string led 'The Burning Sand'. And then there is the magickal dark hymn that is 'Dionysus' where in stark ice cold Nico-like tones she recites the Aleister Crowley poem over dirge-like synths, worming electronics and snare drum rolls. Accompanied by a chorus of black angels, it's a wonderful tribute to the poetry of the much maligned and misunderstood Great Beast. Just as she did with 'A Jealous Lover' on Tumult In Clouds, Ela avoids the sensational trappings associated with Crowley, here honing in on his words of bacchanalian intoxication. 'The Sky And The Ghost' the lead song from Upper Hell appears here as 'Ghosts and Whispers' in a starker and more sympathetic brittle form. Those effortlessly cool solemn tones, bathed in eerie background treatments, telling of heartbreak, loss and depression, remain set, albeit incongruously, amidst an inviting backdrop of piano chords as dance beats abound. This time around though, I'm transfixed by the beguiling 'Beatrice'. Based on a poem by Sara Teasdale it bursts from flickering cut-up electronics into something symphonic, something majestic. It captures what I love about the work of Ela Orleans; casting downbeat plaintive vocals against electro sequences and atmospheric church organ chime. It like most of her work results in something far greater than the sum of its parts, creating another wonderfully otherworldly slice of ghost-pop.